Why Is the US Deporting Refugee Families? A dangerously speedy process is sending children and their parents back to danger in Central America. The White House rang in the New Year by slamming the gates on refugee families seeking sanctuary. Immigration and Customs Enforcementm (ICE) announced quietly, in the midst of the holiday break, that it would begin raiding and deporting Central American families who have failed to qualify for asylum. Their impending exile, according to ICE, is a matter of upholding rule of law, apparently to make it clear that the United States takes border control seriously and seeks to somehow deter mass migration. The law the Obama administration is following, immigrant advocates say, runs counter to the higher mandate the White House should be abiding by. International humanitarian law actually dictates that these desperate parents and children be granted protection from the persecution and violence they have fled in their home countries. The tens of thousands of children and parents who have been criminalized by Homeland Security—designated as those who have received “a final order of removal” as of January 1, 2014—are actually seeking refuge from drug-war violence, political instability, epidemic poverty, and the utter failure on the part of the governments of Honduras, Guatemala, and El Salvador to protect vulnerable communities—a slow-burning social unraveling in which Washington’s policies have played a considerable part. Overall, roughly 100,000 family members have arrived from Central America over the past two years—primarily mothers with children, many of them seeking asylum—along with some 100,000 unaccompanied migrant and refugee children. There was also a spike in the number of unaccompanied children and family members entering the United States in October and November—more than 23,000—exceeding the previous year’s migration rate. Those slated for deportation have spent months bouncing around a legal gauntlet that baffles even attorneys, let alone 7-year-olds who don’t speak English, or young mothers suffering from post-traumatic stress. A subset of families have been jailed in prison-like private detention centers, unable even to secure their release on bail so they can prepare their cases and live with community or family members. A total of more than 15,000 family members have gotten removal orders; perhaps 12,500 families have stayed in the country and avoided deportation, despite having exhausted the legal process. Though they are technically “deportable,” banishing these families is a striking about-face from Obama’s earlier promise that he would reform immigration policy to protect “families, not felons.” First, ICE came under heavy criticism for detaining families in harsh, often abusive conditions. Now instead of incarcerating parents and children together, the administration is moving to deport them together. Many migrants lacked legal counsel or didn’t even show up for the hearing before their claims were rejected. The administration’s indifference to today’s migrants betrays the flimsiness of Obama’s earlier humanitarian overtures. Not only has the administration largely failed in its promise to provide refugees with an orderly, legal refugee migration route by allowing claims to be processed within the region, outside the asylum process; it is now brazenly shredding the Bill of Rights for refugees. By the government’s own estimates, the vast majority of the migrants are thought to have valid asylum claims, according to advocacy group Kids In Need of Defense (KIND). However, without guarantee of legal counsel under immigration law, their cases may be doomed. Currently about half of child arrivals must brave the immigration bureaucracy without the support of legal counsel. 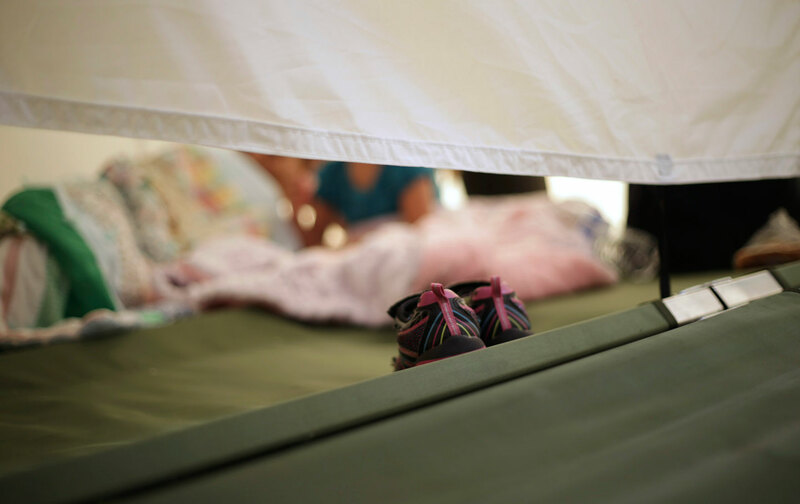 A child’s fate can hinge solely on whether they are fortunate enough to connect with an ad hoc voluntary brigade of pro bono attorneys: “children without representation are five times more likely to be deported back to danger,” according to KIND. Children have wended through a truncated 21-day processing schedule known as “rocket dockets.” Court review has been conducted haphazardly, according to Politico, subject to the whims of individual judges. Many claimants lacked legal counsel or didn’t even show up for the hearing before their claims were rejected. According to the research group TRAC, of 64,500 family migration cases that have filtered through the courts as of late 2015, fewer than 40 percent had legal representation. Among those, a small fraction of the cases were fully resolved, resulting in fewer than 700 being granted relief. For those cases without counsel, however, the outcomes were even bleaker: Just 38 were granted relief, and more than 15,300 ordered deported. Thousands of stories like Lilian’s have been piling up in court dockets. Yet, instead of listening to their pleas, the White House has sought to “dispose” of their cases by making migrants fear the United States just as they feared for their lives in Central America. Whether in a Texas courtroom or on a Salvadorean street corner, the feeling is the same: Nowhere is safe.